Earlier today, Entertainment Weekly unveiled the cover of their latest print edition which featured our first look at Thor (Chris Hemsworth), Hela (Cate Blanchett) and Valkyrie (Tessa Thompson) from Thor: Ragnarok, which hits theaters November 3. 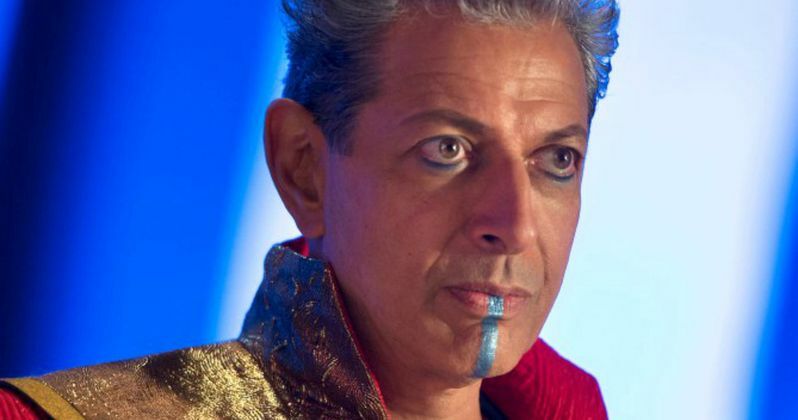 That was just the beginning, though, with EW now unveiling nine more photos, which give us our first look at The Grandmaster (Jeff Goldblum) and Loki (Tom Hiddleston), along with the new short-haired Thor in his gladiator armor, complete with war paint and shield. We also get some behind the scenes shots with director Taika Waititi interacting with cast members Chris Hemsworth and Tessa Thompson on the set. These photos from Entertainment Weekly unfortunately aren't accompanied by any further details about the story, but the gladiator armor we see Thor wearing is likely what he'll use to take on his fellow Avenger, Hulk (Mark Ruffalo). It has been confirmed that Thor will visit the planet Sakaar, which was featured in the iconic Planet Hulk comic books, where Thor will have to take on the current gladiator champion of the planet, Hulk. It has also been confirmed that the Planet Hulk character named Miek will appear, but don't expect a straight-up Planet Hulk adaptation. While fans have been clamoring for a Planet Hulk movie for years, it's not possible at this time, since Universal Pictures still holds the distribution rights to the Hulk character. Thor: Ragnarok will implement elements of the Planet Hulk story into this film, merging it with the Ragnarok comic book arc. While it's clear that both Hulk and Thor will have to fight in this gladiator contest, it has also been said that they will go on a "cosmic road trip" together. Thanks to some set photos and the post-credit scene of Doctor Strange, there is also another element of the story that has been revealed. Most of the Thor: Ragnarok shoot took place in Australia, but there was a small portion where Chris Hemsworth and Tom Hiddleston shot in New York City. One of the photos from the set showed Chris Hemsworth holding a card that read 177A Bleecker St., which, in the Marvel Comics is the address of Doctor Strange. These photos surfaced before Doctor Strange opened in theaters, which featured a post-credit scene where Thor paid Doctor Strange a visit, asking for help in finding his father Odin. We also saw set photos of Anthony Hopkins' Odin dressed as a crazed homeless person on the streets of New York. Thor: Ragnarok is directed by Taika Waititi from a screenplay by Eric Pearson, with a story by Craig Kyle & Christopher Yost and Stephany Folsom. The supporting cast is rounded out by Idris Elba as Heimdall and Karl Urban as Skurge, with Benedict Cumberbatch reprising his role as Doctor Strange. Kevin Feige is producing with Louis D'Esposito, Brad Winderbaum, Victoria AlonsoThomas M. Hammel and Stan Lee serving as executive producers. Take a look at these new photos below from Thor: Ragnarok.